Not been out much locally recently but a trip (or perhaps as so many people do it, a pilgrimage!) 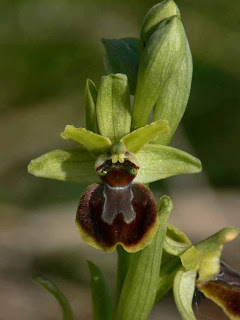 to Dorset in the past few days gave the opportunity for a walk along the Purbeck cliffs to see Early Spider Orchid (Ophrys sphegodes) and thus start to catch up with the Greeks. 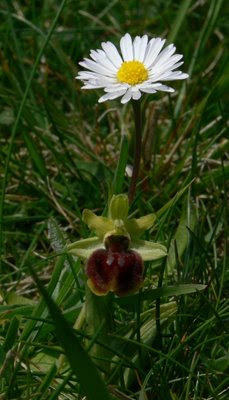 This species is at the northern limit of its European distribution and is confined to the warm chalk and limestone of southern England in Kent, Sussex and Dorset. Most populations are found very close to the sea although one of the largest colonies at Woodingdean in Sussex is about two miles inland. Generally it is a plant of very short turf having very little capacity to compete with strong-growing grasses. In Dorset it is typically a plant of the cliff edge and quarries that abound in the area as the rather cheesy picture on the left illustrates. This year we did find large numbers growing in rough pasture a bit farther back (10metres) from the cliffs that had been winter-grazed. Plants are often quite small the second picture shows an extreme example, the daisy flower is of Bellis perennis about 7cm high. In recent years O.sphegodes has shown an amazing propensity to colonise suitable fresh habitat at Samphire Hoe, near Dover (see Kingsdowner blog and picture to the left). 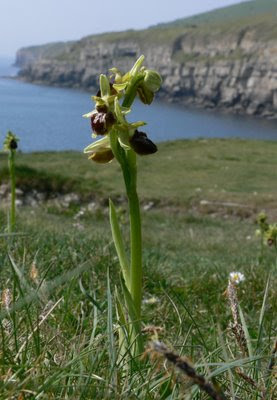 The Hoe was created from spoil from the Channel Tunnel diggings and in the intervening 12 years since it was completed the number of O.sphegodes plants have increased from less than 100 to over 10,000 making it one of the largest colonies in the country. In Dorset I suspect that if there was more suitably timed grazing there would be many more plants. One thing is certain however that this species is one of the gems of the British flora especially flowering so early in the year. Fascinating stuff. Great 'scale' photo with the daisy. lovely to see other native orchids in situ. That's not a cheesy photo - it's very effective, showing the plant clearly, and indicating its habitat. The photographic term is, I understand, bokeh. Thanks for the kind comment but bokeh to you too! Seriously, the reason I used "cheesey" is because I have seen so many others do exactly the same thing with the same species. I have never managed original. Many more to come I hope. Thanks for the comment. I thought it was original but then I found a picture in Lousley's Flowers of Chalk and Limestone with a daisy but it wasn't so small.